Forget Aerosmith and Run DMC, step aside Kanye and Kid Cudi, see ya later Maroon 5 and Travis Scott, there’s a new collaboration in town. And this time it’s tasty. Two of the nation’s – nay, the world’s – favourite fast food chains are coming together to create a mighty, mammoth meal, which is sure to answer a lot of questions, but also raise many, many more. Like a weird, edible Venn diagram, Pizza Hut and KFC have joined forces to create ‘The Gravy Supreme’ – a new pizza made from a combination of KFC gravy, popcorn chicken and Pizza Hut’s cheesy bites. 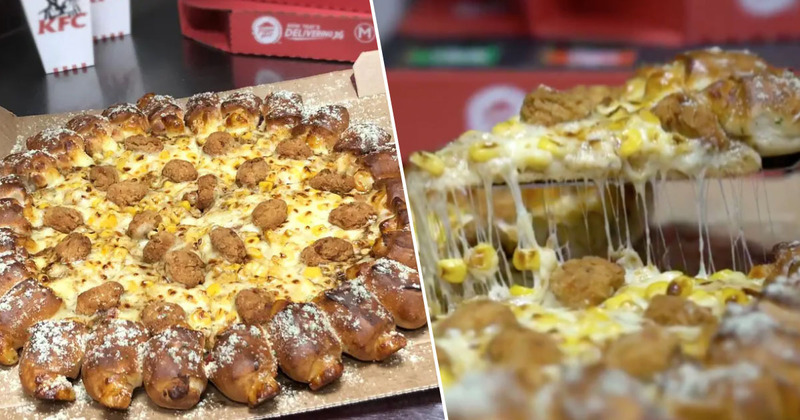 The new creation is in celebration of National Pizza Day today (February 9), and it consists of: a Pizza Hut base with a cheesy bites crust, KFC gravy (instead of tomato sauce), popcorn chicken, sweet corn, mozzarella and garlic sprinkles. It may sound delicious, it may sound weird, but either way, you know you’re going to want to try it, out of intrigue if nothing else. Unfortunately, it’s not yet available to order. It’s being trialled at Pizza Hut and a few of KFC’s ‘chief innovators’, though if this doesn’t get through testing I’d be very surprised. If the demand is high enough (gonna go out on a limb here and say it will be), it should be available next year. Dreams really do come true. Pairing our signature gravy and Popcorn Chicken with Pizza Hut’s famous base and toppings is a match made in heaven. Believe us when we say it’s a thing of absolute beauty. KFC and Pizza Hut are both owned by the Yum! brand, a Fortune 500 corporation, so the mega collaboration shouldn’t come as too much of a surprise. Cheese, chicken and gravy on a pizza that will be delicious though? That’s a surprise I want to try. Happy National Pizza Day everyone!